Alopecia Areata Hair Loss Treatment in East Orange NJ | Guci Image Inc. 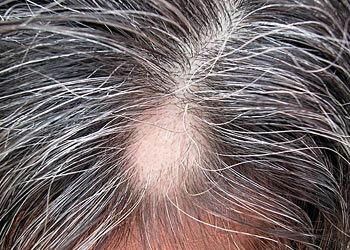 When alopecia areata results in patches of hair loss, the hair usually grows back in 6 months to 1 year. Although the new hair is usually the same color and texture as the rest of the hair, it sometimes is fine and white. – Have a family history of the condition. – Have the condition at a young age (before puberty) or for longer than 1 year. – Have another autoimmune disease. – Are prone to allergies (atopy). – Have extensive hair loss. – Have abnormal color, shape, texture, or thickness of the fingernails or toenails. Because hair is an important part of appearance, hair loss can result in feeling unattractive. Guci Image a leader and expert in the field of hair loss solutions has been helping clients deal with the emotional effects of Alopecia Areata for over two decades. Innovative technologies combined with our extensive knowledge in treating all types hair loss can help relieve stress and regain your confidence and beauty. – Hair analysis. Your doctor will take a sample of your hair and examine it under a microscope. A scalp sample is also sometimes taken. – Blood tests, including testing for a specific condition, such as an overactive or under active thyroid gland (hyperthyroidism or hypothyroidism).